Most of us buy food. Whether you are young or old, married or single, liberal or conservative. We do it consistently, maybe once a week or once a month depending on your routine. Because this is the shopping most of us do most often, these trips are completely loaded with opportunities to do good. If we all changed one of our grocery habits, we could cut down on waste, cut down on fossil fuels, and end single-use plastic for good. When we make good choices as a routine, we will be healthier. Better choices for the Earth are ALWAYS better for the world as well. We will make a tiny positive change in our environment. We will also collectively be voting for changes in a way grocers can hear it. 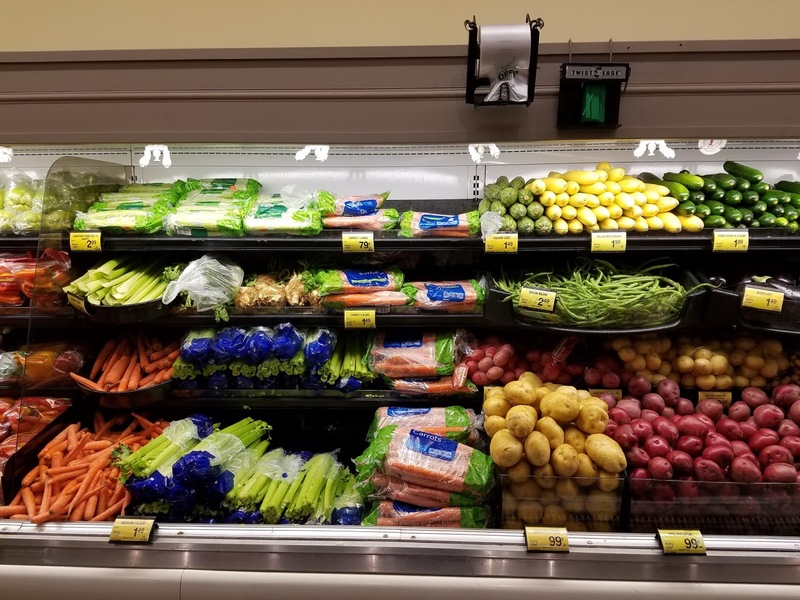 If they notice people aren't buying plastic-wrapped produce, they will stop providing it. If we put more money into local companies, they will support those companies more as well. We can send message after message that these stores should change their approach as we transform ours. In most produce aisles, there are bags of salad. A few feet away, there is lettuce, just sitting, not wrapped in plastic. Often, that head of lettuce (or spinach or kale) is cheaper. So why do we do it? We don't want to have to rinse? How much time does it actually save? So let's just not anymore. Time to buy our spinach naked, peeps. The less packaging your food has, the better it is for you and the environment. Want to be healthier? Want a cleaner world? Want to make less waste? Stop supporting Big Oil? It all comes down to buying things with less packaging. Plastic packaging is a major culprit in the pollution of our Earth and our bodies. More and more studies tell us that plastic leeches chemicals into food, including BPA, which definitely messes with our hormones and could be a major cause of endocrine problems and even cancer. That same plastic doesn't break down, so after it leeches into our food, it heads to our landfills or our water, and it will be there for centuries after we are gone, slowly leeching more of its nastiness into the Earth. So you can buy things with less packaging. You can check out the bulk section in your store (or try a store that has one). You can buy your meat from the counter and skip the piece of styrofoam that comes with the pre-packaged ones. Nutritionists set this simple rule to help people eat healthier; shop around the outside edge of your grocery store. In most cases, this is where the fresh produce, meats, and dairy live. The food that will go bad, some of which needs refrigeration, is what is actually good for you. Things that live in those center aisles are general packaged to last and have little nutritional value (think about it- cookies, chips, pop, freezer food all live in the center of the store). Want to eat healthier but don't want to buy all in for a diet? Limit the stuff you buy from the center and you will be slimmed down in no time. Guess what? What is good for you (not cheap and easy... GOOD) is also good for the Earth! All of those super packaged and unhealthy foods create a ton of waste- A pack of Oreos has two pieces of plastic packaging. Cereal, pop tarts, and other boxed foods still have plastic inside. More on the awfulness of all that packaging later, but eating healthy foods that will go bad will do your body and the earth all kinds of good. So, why not just shop the outside edge? I figure our bakery is still there too, so this is really all just a ploy to eat more doughnuts and cake. As is everything I do. We should all eat more plants. We all know it will make us healthier, we have been hearing it since we were kids ("eat your broccoli! "), but we don't necessarily actually do it. Here's another reason to bite the bullet (or the broccoli). 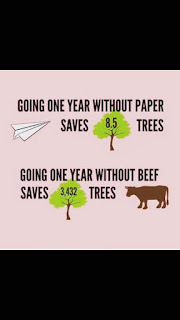 Meat production causes exponentially more waste than other foods. 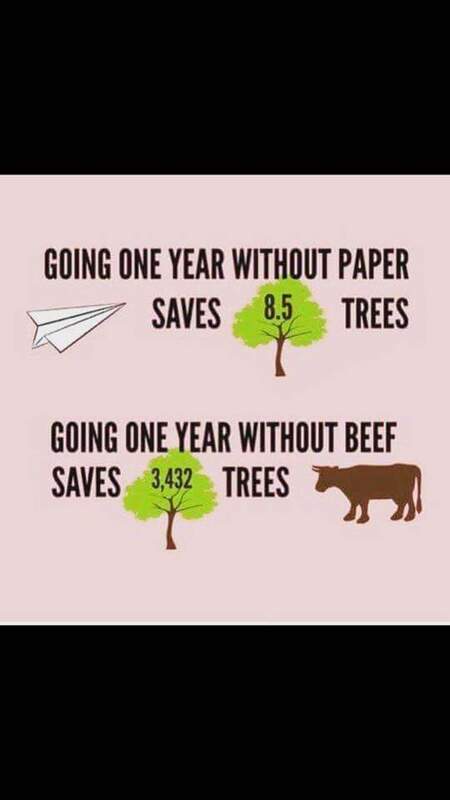 Want to save trees? Check out this chart. Beef is especially bad, using more water and energy than most other proteins combined. You can save more water by cutting your beef intake by half than you will by cutting showers shorter. You can use fewer fossil fuels without shortening your commute. Beef is also infamously bad for your heart, and Americans have a huge problem with heart disease. The cause is obvious and the change is important. Just by making beef less of a staple in your diet, you can get major environmental and healthful bang for your buck. If you want to become a vegetarian, that's awesome, go you! We are not vegetarians. We will never be vegetarians, or I am not sure The Boy would stay with me. You don't have to give up everything to give up something (and make a big impact!). If you eat beef a few times a week, switch turkey in for most of those meals and turn beef into a once a week meal. Decide to make it a treat for eating out and special occasions. Eat it in smaller portions. Commit to more vegetarian meals (hello, Meatless Mondays or veggie lunches). Do what works for you, but start at the grocery store. 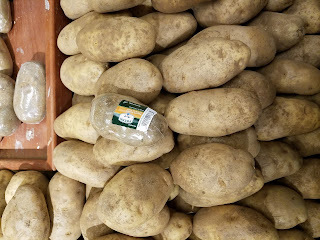 Sometime, many years ago, some dastardly fiend convinced us that all of our produce needed their own little plastic bags. Why do we need these? What are we protecting our produce from? We are going to wash it all anyway! Why not just leave your reusable bag open and put them all in there. Want certain things (like peppers) to get their own space? You would only need a few reusable produce bags. Does it take a minute longer at checkout? Yes. But a minute. 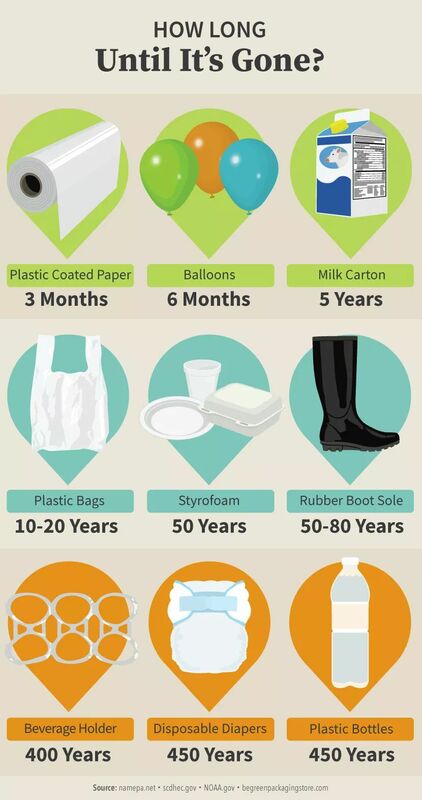 And that minute is nothing compared to the hundreds of years that plastic bag will sit in a landfill. The trick to this is learning where you live- what are people making nearby? What can be grown in your area each season? Best place to start? Your locally-owned grocery stores. They will often carry more local products, ship things from shorter distances, and it keeps money in your community! Yes, Walmart is cheaper. Walmart is also terrible for your community, for its workers, and for the environment. Even if you don't buy everything from local grocers, you can start planning menus around it or stock your pantry with local items. I guarantee you don't know all of the great stuff being made or grown nearby. Another good option? Farmers markets. As more organic and local diets gain popularity, you can find more farmers markets popping up all over the country. Pick one as part of your regular routine or just go explore one and see what is out there. 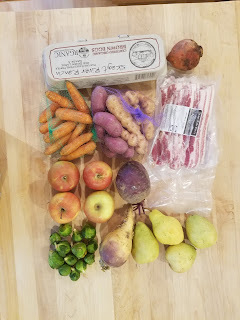 We go to a farmer's market every other Saturday or so. We get lots of our produce, the world's best bacon, and we usually get something delicious and fresh for lunch. I love it. The last key? Know what is growable in your area in every season. Keeping food that aren't in season fresh or shipping them from far distances uses way more energy. Instead, check out seasonal calendars like this one (just search for "seasonal calendar + your home state). Some seasons are easier than others, especially depending on what region you live in, but the more you can do this, the better food you will eat and the more good you will do. Lots of what we buy at the grocery store, from toilet paper to produce to meat to toothpaste to potato chips could be bought in bulk to cut way down on packaging. If you buy an 8 pack of toilet paper in a grocery store, they usually come wrapped in plastic. By the time you have bought as many as come in these bulk packs, wrapped in paper, from Seventh Generation, you have added so much plastic to a landfill. Maybe go check out a Costco or another local bulk store. Even Amazon has more ethical options that you can buy in bulk.The money you save is great. You can read more about what you can save and find in my Greening the Basics posts. The packaging you cut down on is also awesome. If you have the room, it just makes sense. Is it organic or fair-trade? Where was it made? Look for "manufactured by"- "manufactured for" probably means they don't want to tell you where they made it. 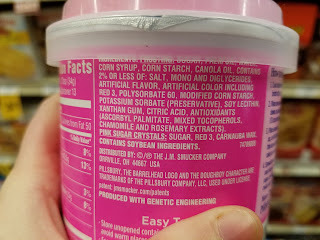 Notice this can of frosting was "distributed by" a company in Ohio, but they avoid saying where it is made. That is a bad sign. Would you eat something left on your doorstep if you didn't know where it came from? So why are you paying money for something like that? How many ingredients does it have? More ingredients, in most cases, means more chemicals. We looked at frosting before. Frosting made at home has 4 ingredients. The frosting in those cans has 20+. At first, checking the labels seems like an annoying slow down of an already tedious chore. Some of us might check for nutritional information, but hardly anyone checks for the ethics of its making. But it is so worth it, and once you find products that are not so sketchy, you start to appreciate this little effort. Did you know about plastic film recycling? Lots of the plastic packaging you get at grocery stores can actually be recycled too! Plastic film is the plastic wrapping used on your bread bag and around paper towels. You can save so much plastic, and it costs you nothing! I didn't know about this until a friend told me, and it has cut down the waste in our household so much. Want to see which grocery stores near you accept plastic film recycling? Check out this website. We believe here at this blog that any step is a good step, and that the eco-friendly step that makes sense for one person might not be the one that you can really sustain. Any effort you are making is great, and continuing to make little changes is even better. If you haven't switched over to reusable bags yet, let me suggest that is the next step you take. Here is a Ten Step Plan to break your single use plastic bag habit forever, because at this point, we all know it is wrong. Don't keep doing it just because it's easier or because your local government hasn't banned it yet (the plastic bag lobby exists and it is ruthless). You know it is wrong. So stop. Food waste is one of the defining tragedies of our (and our parents') generation. In an average American household, 400 dollars of food is just thrown away per person per year. We waste so much that what we throw away per year could feed us for another month and a half. Think of how many people out there need food, and we throw things away like they are nothing. We have to do better at buying the right amount and using what we buy. An empty (or nearly empty) fridge come grocery day should be the goal. I know this is one I am continually working on. I have so much trouble getting myself to finish off leftovers or eat the good half of an older piece of fruit. It just never feels like much fun to eat. But I am working on it, because it is so important. The coolest thing about this is that we all grocery shop so much that we can multiply even the smallest good decisions into something huge. All we have to do is reset our habits. It's like putting one dollar in a jar once a week- at first, it won't feel like much. But a year in, you have fifty bucks! 10 years in, 500! Little changes do add up and if we all choose to keep doing better, we can change the world from our grocery stores! 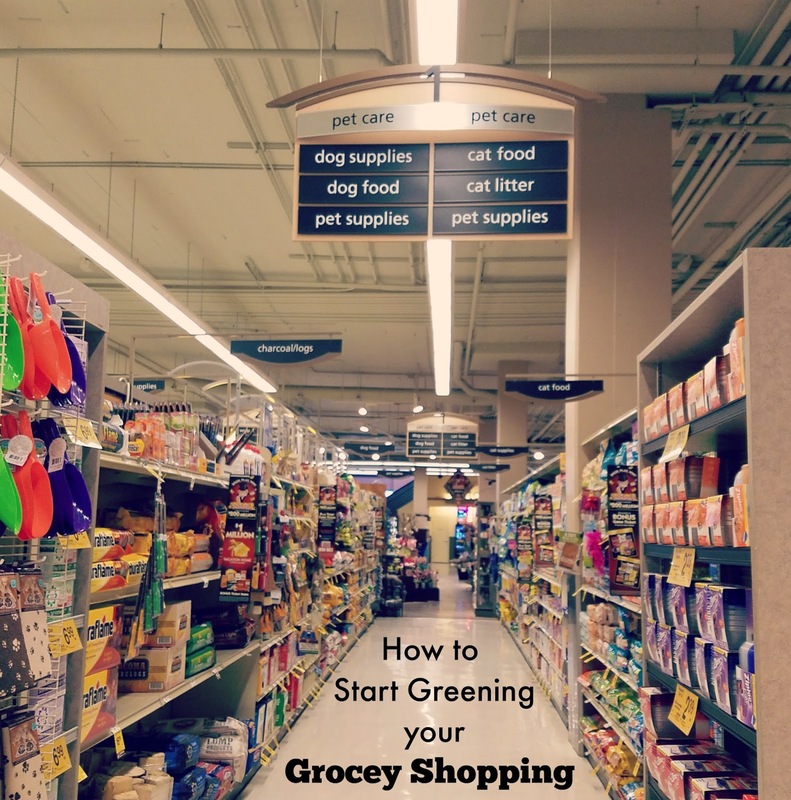 How do you make your grocery shopping more eco-friendly?